As you may know, the Ashton & Parsons brand is full of heritage, dating all the way back to 1867 (see timeline). At Alliance Pharmaceuticals, we love to learn more about the rich history of the brand and collect items that form part of its past. 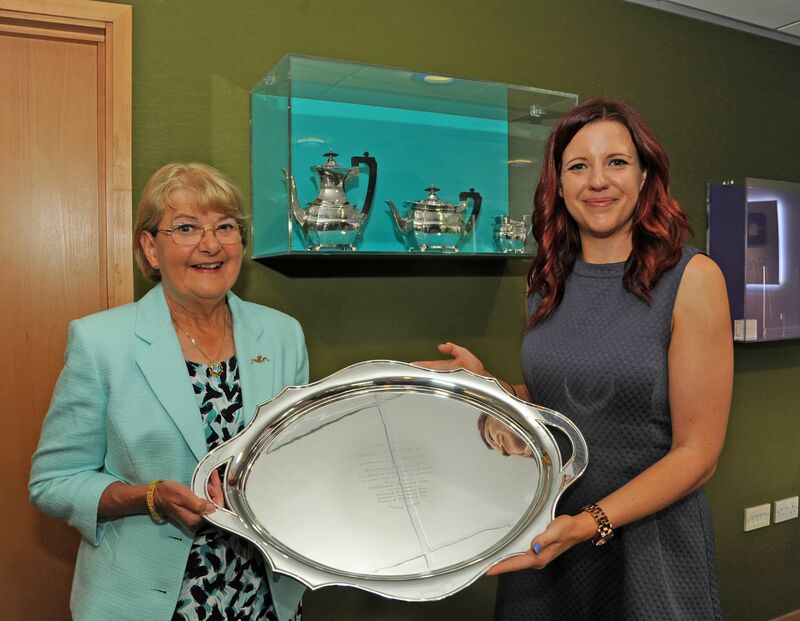 When Liz Carter contacted Alliance in August 2014 with details of a Silver tea set, belonging to her grandfather, awarded to him from Ashton & Parsons, we couldn’t wait to find out more! With all the National interest in the 100 year anniversary of the First World War, Liz wanted to tell of her grandfather’s efforts, and this is the fascinating story that followed…..
Liz’s Grandfather; Henry Victor Hayward (Harry), started as an office boy at Ashton & Parsons Limited in 1895 at the age of 12, working his way up to General Manager. Back then, Ashton & Parsons Limited produced and sold homeopathic remedies and tinctures, homeopathic medicine chests, homeopathic books and agents’ cases as well as teething powders, worm powders and Phosferine. During the First World War, Harry was unable to join the forces due to osteoarthritis, however, it was during this time that he made a significant contribution to the conveying of medicines to the soldiers and manufacture of tablets in general. 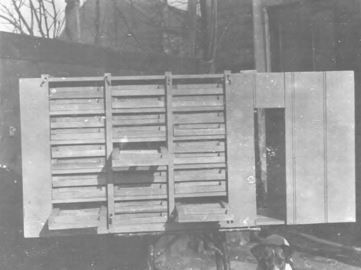 Working as a commercial traveller at the time, Harry came to realise that tinctures and powders were not easy to transport, so he set about inventing a drying cabinet to enable Ashton & Parsons to distribute their products more easily. The drying cabinet was able to dry the medical potions (especially Phosferine) into gelatine tablets so that they became smaller, more easily managed and conveyable to the front line. For this valuable contribution the Chairman, Sir Herbert Parsons BT and Directors George, Norman and Harold Parsons of Ashton & Parsons Limited presented Harry with a Silver Tea Service on 1st August 1918. Henry served with the company until 1938 when he took early retirement aged 55, after 43 years of service. Very well deserved too! Liz remembers that the tea service always had pride of place in his living room and he showed it to her in detail for the first time when she was 9 years old, promising that one day it would be hers to treasure. Her grandmother was particularly proud of the set and used it to serve tea on an almost daily basis. She must have had good muscles because the tray alone weighs about 7lbs! 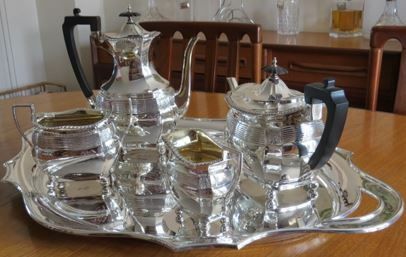 Liz very kindly offered to loan the Silver Tea Service to us to display in our offices, to better serve as an historic example of the type of undertaking behind the scenes that ordinary people achieved in supporting the War effort at that time. We are thrilled to have the opportunity to display the tea set along with the other Ashton & Parson historical artefacts in our collection. 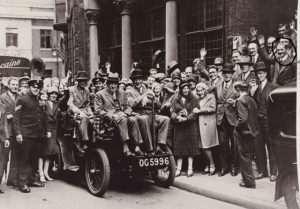 As well as the Silver Tea Service and the original drawings of the drying cabinet, Liz also shared with us a photo of the staff of Ashton & Parsons Limited, including her Grandfather, outside of the Ashton & Parsons premises, La Belle Sauvage in Ludgate Hill, London. Liz came to visit the Ashton & Parsons team at Alliance’s head office in Chippenham on the 6th August to present us with the beautiful tea set, which now sits in pride of place in our reception area. A fantastic day was had by all, piecing together and celebrating these moments in history, which may have otherwise been forgotten. Chippenham’s deputy Mayor Terry Gibson and his wife Sylvia also joined us for the day. All that remains of the Ashton & Parsons range of products is the Infants’ teething powders which Alliance acquired in 2011. We will be very proud if we are still producing the powders in another 100 years-time!